(Photo by Darren Andrew Weimert) Jackie Hook (left), of Koch Funeral Home, speaks about loss and healing with Town&Gown founder Mimi Barash Coppersmith at Cozy Thai Bistro. (Photo by Darren Andrew Weimert) Jackie Hook (right), of Koch Funeral Home, speaks about loss and healing with Town&Gown founder Mimi Barash Coppersmith at Cozy Thai Bistro. For the past five years, certified spiritual director, celebrant, and end-of-life doula Jackie Hook has specialized in loss and wellness. After experiencing devastating losses in her life, she now provides support to individuals as they grieve by creating opportunities for meaningful conversations to occur on loss, grief, growth, and transformation. In partnership with Koch Funeral Home, Hook developed Helping Grieving Hearts Heal, which offers services including Having the Talk of a Lifetime, grief companioning, memorable funeral ceremony creation, remembrance service facilitation, legacy reception coordination, and community outreach. She spoke at the National Funeral Directors Association Convention in 2018 and will speak at the Pennsylvania Funeral Directors Association Convention this year. She is a member of Spiritual Directors International and the Celebrant Foundation and Institute. In addition, she co-leads HEART – Helping Empty Arms Recover Together, a group that provides support for individuals who have experienced pregnancy loss, stillbirth, infant death and fertility issues. A State College native, Hook earned her Bachelor of Science degree in business management from Penn State University and a master’s degree in wellness from the University of Central Florida. After living in Orlando, Florida, and then Yardley, Pennsylvania, for two decades, she and her husband, John, moved to this area in 2005. They have two children, Jessica, 24, and James, 18. Jessica graduated from the University of Central Florida and James is a senior at State College Area High School. 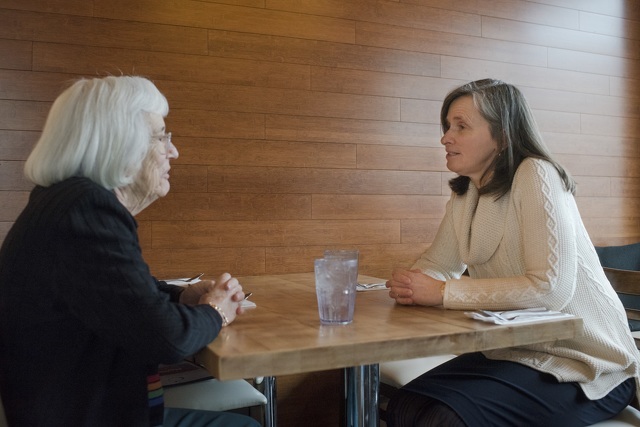 Town&Gown founder Mimi Barash Coppersmith sat down with Hook at Cozy Thai Bistro to discuss what lead her on this path and how individuals in our community can get the support they need to address the needs of mourning and begin the journey of healing. Mimi: I’m curious to know, what was the underlying motivation to get you on this path? Jackie: My husband, John, and I lost our first six pregnancies, and that was a tough experience. We also suffered with infertility years before that, so it was a long road. During that process we were living in Orlando, Florida, and we found a support group. Attending that was significant for both of us and allowed us to feel that it was OK to grieve like we were. From that, it changed who we are as people; it changed who we are as parents. Just as I was reading in your book – grief and loss, there can be opportunities in it. From the good that came from that, I wanted to be able to help others experience it as well. I wanted to create spaces where they could sit with their grief. Mimi: So, what is the catalyst that motivated you to homeschool your children? Jackie: We appreciate what a gift they are because of the years of struggles it took to have them. We feel like they’re really gifts. When our daughter was preschool age, we told her how great school was and that she was going to love it. She went to preschool, came home, and said, “I’m not learning anything. I have to line up to do this. I have to sit down and do this.” So, that year we looked at homeschooling, and decided when she was in kindergarten, we would homeschool her. She’s the type of learner who wants to do it on her own, so it was a perfect match for her. Every year we would say, “You can go to school if you want, or you can stay home.” And she would choose to stay home. When our son was born, that’s all he knew. I would sometimes tease that if he had been born first, we might not have homeschooled, because he likes a regimen. They both chose to go to school at the same time – it was her first day of her senior year of high school and it was his first day of his sixth-grade year. Mimi: How do they feel about homeschooling today? Jackie: I think they would both say they appreciated it and are glad they did it. They got to spend a lot of time with one another. They know that school is a choice, so they haven’t felt trapped. Mimi: How do you homeschool? There must be places you can refer to for the materials. Jackie: There are more and more these days. When we were doing it, you had to submit your objectives every year and a portfolio at the end of the year, and they go through it to make sure you’re keeping up. Mimi: So, there are checks and balances? Jackie: Yes. Pennsylvania is actually one of the strictest states to homeschool. Mimi: Are you glad you did it? Jackie: Oh yeah. I wouldn’t trade it for a minute, because I got to spend so much time with them. We learned out in the world, traveled, and went to different places around the U.S. We would read books before we went. Mimi: Do you think it had a major impact on them? Jackie: I think it impacted our daughter because of the way she likes to learn; it was the best choice for her. Our son, I think it was the best choice for him up until the time he decided to do something different. But he had a good foundation by then as to who he was. Mimi: Talk a little bit about your work as a celebrant and what that feels like for you. Jackie: A celebrant is someone who helps people create ceremonies and rituals for life’s transitions. I primarily do funerals and memorial services – transitions after death. It’s a profession that started in Australia and New Zealand because some people didn’t have a church home, but they still wanted to have ceremonies and rituals. Sometimes I work with people who consider themselves spiritual but not religious; sometimes they don’t want any spirituality or religion in it at all. My role is to create the kind of service they want. I don’t have any agendas going into it. For me, it feels like a gift. I say there are two main reasons I appreciate this work. One is that people who are dealing with loss and death know what matters most in those moments. They’re not worried about the superficial things in life. They’re talking about the real issues. And another thing is, they would rather have their loved ones back, but many times they find the opportunities like we just talked about from the loss. So, I like to hold up that hope for them. It’s a struggle, but they find new answers, new meaning, and purpose. Mimi: There is new life after death. Jackie: Oh yeah. You know that. You’ve lived it. It’s not easy to see; it takes a lot longer than you want it to. And there is so much beauty right there in those experiences. I get to sit with families and listen to the stories of their loved one’s life. There’s so much love in the room as they share these stories. There’s some sadness, some anger, and some pain. Mimi: What’s the most significant experience among those that you’ve had? Jackie: Wow. Each is significant in its own way. I worked with a family whose young daughter, in her twenties, died tragically and suddenly in a car accident. That family was very open to sharing their love and receiving the love from others, and the elements of the ceremony were just so touching. I did a service not too long ago where there was just so much love in the room. There were little ones singing. I remember seeing a grandmother standing at her husband’s open casket talking to the grandchild about him and telling stories. There can be such touching moments. Mimi: So, when did this idea of doing what you’re doing now develop? Jackie: I went to training for spiritual direction, I think probably eight or nine years ago. So, that’s talking to people about their life from the spiritual perspective. And then, John and I had been in touch with Evelyn Wald, a grief counselor and mental health provider in State College. And we started HEART, Helping Empty Arms Recover Together, a group for parents and couples who have experienced pregnancy loss, stillbirth, or early infant death. After our experience in Florida, we wanted to do it here. I really appreciated doing that and being with people who were grieving. I met with Glenn Fleming and we started talking. He brought in Dar Bellissimo, and we created the Helping Grieving Hearts Heal program. Glenn believes strongly that funerals aren’t about closure. His role is to help people on their start to a new life without their loved one. He works with me to do programs for people to help them. When we were developing this program, I read about celebrancy and said, “Do you think something like that would work here?” He said, “Yes. There are going to be more and more people who want that.” I recently completed the training and am working on the certification for end-of-life doula, who is a companion and coach who provides families practical and emotional support through those final days and weeks. Mimi: This is really more in the area of mental health when you think about it. What is our future as a community as we now have far more people aging and living longer? How do you see programs like this impacting the community directly? Jackie: People are hungry to have these kinds of conversations, but they’re afraid of them. I think the more we can create opportunities to have these important conversations, the healthier our community will be. I offer what I call grief companioning, because I’m not a mental-health provider. My role is to walk beside people, not to direct them or lead them or push them. It’s to be right with them. Kahlil Gibran has a quote about the deeper sorrow carves into your soul, the more joy you can contain. I think about Happy Valley. In order to be happy we have to allow people to experience the pain and to hold the grief. Opportunities for people to talk about it, opportunities for people to express it, write about it. Your book is a great example of sharing your story. Mimi: Everybody’s life is a story. What do you do for fun? Jackie: I like to travel, go for walks, and hike. I go to a lot of sporting events because of our kids and just spend time with the family. Mimi: So, it’s a good life. It’s a unique talent, but a great gift. Jackie: Exactly. That says it well. Mimi: God bless you. You are doing a form of God’s work. I wish you the best. For more information on outreach programs, visit www.kochfuneralhome.com, or call (814) 237-2712.